A fast and single‐step preparation of patchy LnF3 faceted‐charge nanocrystals are described. 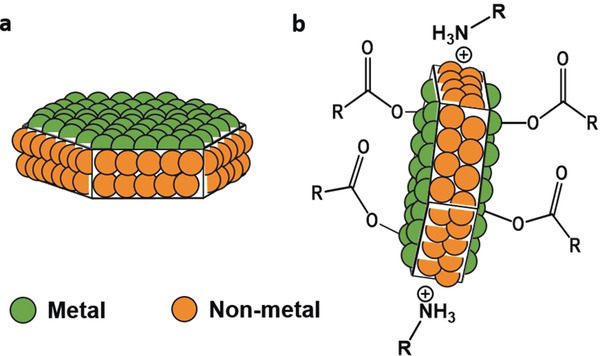 These hexagonal faceted nanocrystals allow the spontaneous selective adsorption of cations or anions in the different faces, producing stable and well‐defined patches of different charge. The mechanism for the formation of the patches and the properties of the obtained nanocrystals were characterized by a combination of experimental techniques and all‐atomic molecular dynamics simulations. The spontaneous dual‐charged surface as well as the luminescence effects that can be achieved by doping host–LaF3 systems make these new nanocrystals interesting both from a fundamental point of view and for a wide range of applications.